Our club display at events usually consists of ‘Tourers’; ‘Box Saloons’; the Ruby types and a ‘Big Seven’, a good across-the-range exhibit. The general public with a casual interest will only see the different body shapes, colours and size. Anyone with mechanical knowledge will notice many differences, the result of continued development that all manufacturers undertake to keep ahead of the competitors. These easily seen changes under the bonnet involve the magneto which came and went; the positions of the starter motor, dynamo and distributor were altered; different carburettors; the size of the fuel tank was increased and its position moved from scuttle to the rear; the diameter and position of the lights; the chromed radiator surround replaced by the enveloping radiator cowl on the ‘Ruby’; the smaller wire wheels and the change to the pressed steel wheels on the ‘Big Seven’. In brief conversation with people having a casual interest we mention that ‘Sevens’ have the 747cc engine (left) except the ‘Big Seven’ which has the re-designed 900cc engine (right). However, making that simple statement does give the impression that the same engine was used for all models from the ‘Chummy’ to the ‘Ruby’. There were many internal changes to the engine, and the discerning enthusiast is able to look at the outside of an engine and say which ‘Seven’ model it is from. # the diameter was increased to 15/16″ in October 1929. ++ the centre bearing is 1¾″. The 747.5cc ‘Chummy’ engine produced 10.5 bhp at 2400 rpm and with modifications to crankshaft and carburetion in late 1929 the output was increased to 12 bhp at 2600 rpm. Significant changes came with the 3-bearing, higher compression, ‘Ruby MK2’ engine, introduced in June 1936, supplying 17 bhp. The 900cc engine fitted to the ‘Big Sevens’ in July 1937, and further modified for the ‘Eight’, has larger cylinder dimensions and higher compression to deliver 25 bhp at 4000 rpm. The first gearbox was the 3-speed crash box fitted from 1922 to 1932. The 4-speed box came in September 1932, still without synchromesh. ‘Twin-top’ synchromesh was introduced on 3rd and 4th gears in August 1933, and the 4-speed box with synchromesh on 2nd, 3rd and 4th came in July 1934, the gearbox being marked ‘2 SYN’. The overall ratios were also changed. The ‘Big Seven’ gearbox is also ‘2 SYN’. The detail of the changes is more the interest of the expert rather than for casual conversation. Austin fitted Zenith carburettors throughout the production of ‘Sevens’ except for some cars in November 1930 were fitted with Amal. CAV electrical equipment (dynamo, cut-out and switch panel) was fitted from 1922 to 1925 with Lucas equipment fitted from 1926 to 1939. 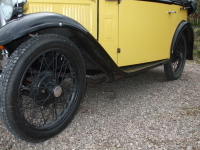 From 1922 to March 1926 ‘Staybrite’ centre wire wheels were 26” with 3½” tyres, and were changed to 19” with 3.50 tyres until March 1933 when 17” wheels with 4.00 tyres were fitted until the end of the ‘Ruby’ production. When the ‘Big Seven’ was introduced in July 1937, it was fitted with pressed steel ‘Easy Clean’ 16” wheels with 4.75 tyres. From 1922 to October 1931’Sevens’ have a 6’ 3” wheelbase with 3’ 4” front track and 3’ 7” rear track. The wheelbase was then increased to 6’ 9” with the track at 3’ 4” front and 3’ 7” rear. The Big Seven has a 7’ 3” wheelbase with 3’ 7⅛” front and 3’ 9” rear tracks. 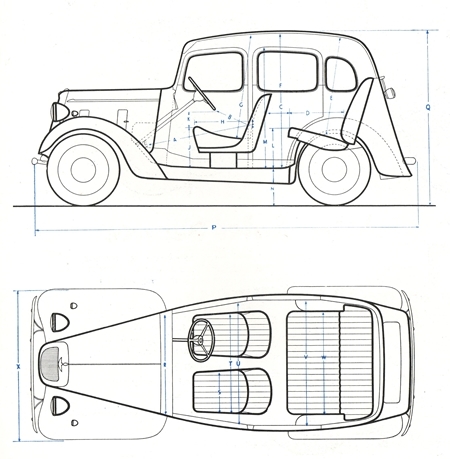 Throughout ‘Seven’ production changes were made to front and rear wings and the running boards. 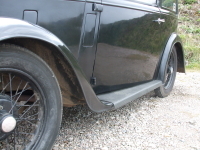 Between 1922 and 1932 there were ten styles of the rear wing, fifteen of the front wing, and twelve running boards. From 1923 to 1937 there were sixty-one different windscreens and body lights, ie side and rear windows. (Photos: left - 1934 AJ Tourer: right - 1935 Ruby MK1). Running boards were not fitted to the Big Seven from its introduction in July 1937 until July 1938 commencing with chassis 13064. 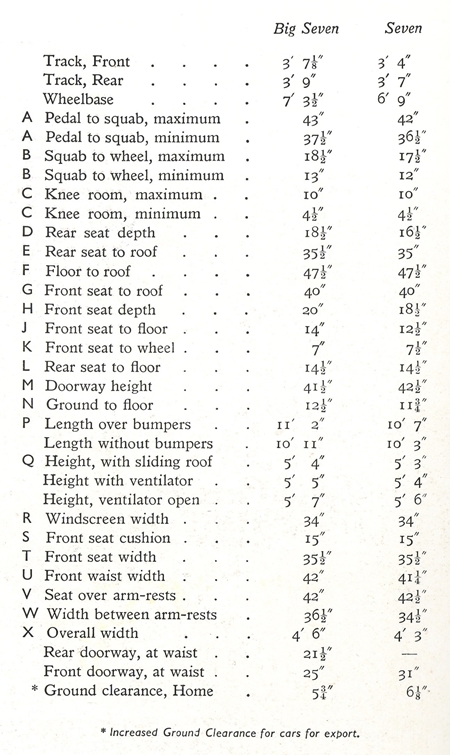 As ‘Sevens’ were developed and the length increased, along with all the changes to engines and ancillary equipment, the weigh of the cars increased. The Tourer ‘Type AD’ of February 1926 weighs 8cwt 56lbs (406.41kg). The ‘RP’ Box Saloon of October 1932 is 10cwt 2qtr (533.42kg) with the ‘Ruby’ models from July 1934 weighing 12cwt 14lbs (615.97kg). The ‘Big Seven’ ‘Sixlite’ of July 1937 is 14 cwt 2qtr 20lbs (745.70kg); with the ‘Forlite’ in March 1938 at 14cwt 1qtr (723.92kg). These diagrams are from pub: No: 1539B 9/37. The Austin Motor Co. Ltd. and relate to the Ruby variants and the Big Seven. ‘The Austin Seven Source Book’ by Bryan Purves provides detailed information on these differences to enhance our knowledge. ‘Original Austin Seven’ by Rinsey Mills also has useful descriptive chapters on the changes. The Austin Seven and the new Big Seven. Pub. No: 1539B 9/37. The Austin Motor Co. Ltd. This article, written by Doug Castle, originally appeared in CA7C Seven Focus in Aug 2008 pp18-20. Ruby MK1 or Ruby MK2 ? - How do you tell the difference?